Chronos is a powerful mine planning tool, but the format of the ‘destination’ tab leaves much to be desired. The following script copies the results in the Chronos destination, into a new tab, in a format that allows for the creation of reports and pivot tables with familiar Microsoft Excel tools. The mine scheduling tool available with Maptek Vulcan, is Chronos (named for the Greek God of time). Chronos combines the visual functionality of Vulcan with the spreadsheet tools in Microsoft Excel. The different tabs created in excel mirror the actual mining process. The initial mining blocks are kept in a ‘Reserve’ sheet until they are scheduled by the Chronos ‘Process.’ Scheduled blocks appear in the 'Destination' tab in a uniquely Maptek format. Final results can be reported out in the 'Period Summary' tab. The format used by Maptek Vulcan to organize the 'destination' tab mirrors the format used in the original Carnac spreadsheet (Carnac was the in-house spreadsheet base developed by Maptek to host the Chronos mine scheduler. It was cutting edge when it was originally developed but this was at a time when Lotus Notes was still a legitimate spreadsheet application.) The 'Destination' tab layout has nine rows of header information at the top of the sheet and six lines of header at the top of each period. In addition to the redundant header lines, Chronos also has a random number of blank lines separating each period. This makes working with the 'Destination' tab very difficult. Maptek has developed their own reporting application to read the crazy layout of the 'Destination' tab. I have found this reporting tool to be slow and frustrating to use. I can't wait hours for Chronos to report out my input only to find out that some of the report parameters were incorrect. This kind of wait for simple feedback hasn't been appropriate since the days of punch cards. What the 'Destination' tab needs is a real layout. 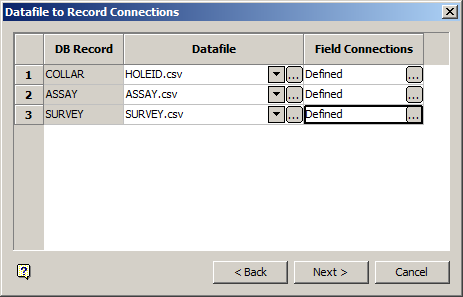 One header line at the top and periods as a field running down their own column. This simple change would allow users to create pivot tables from the results from their schedule rather than punch multiple inputs into an antiquated reporting system. Copy the three script parts to a folder on your computer (chronos_fix_destination.bas, frmFixDestination.frm and frmFixDestination.frx). Open your Chronos workbook with Microsoft Excel (Microsoft will give an error message asking if you want to continue opening this workbook in an unknown format. Click 'Yes' to continue opening this file. Select the 'Chronos Destination' tab and select the 'Results Worksheet' (or type in a new name). If the 'Results Worksheet' exists you will be given a warning that the sheet will be overwritten. That's it. The 'Results Worksheet' is not dynamic so every time you change the schedule you will have to re-run the script but it runs so fast and easy that it will save you a lot of time compared to the existing Maptek Vulcan Chronos reports.